G is an important letter: it stands for two staples of the Marathi diet. The first is Gahu or wheat. As far as diet staples are concerned, India can be divided more or less horizontally across it's middle: the upper half or Northern India eats wheat as its staple carb, refected in the wonderful North Indian breads such as puris, parathas and naans. The Southern half is the rice bowl of India, with its famous flavored rice dishes and idlis and dosas made with rice flour. Maharashtra is right in the middle: neither Northern nor Southern, and the Marathi diet relies almost equally on wheat and rice. The gharge we make today will contain both wheat and rice components. The second important "G" is gul or jaggery. Traveling through many parts of Maharastra, one can see gracefully swaying fields of sugarcane. Much of the sugarcane is sent off to refineries for the production of processed white cane sugar, but another important product is jaggery, made in small-scale industries called "gurhal". Jaggery is a smart choice for a sweetener...it is unprocessed and rich in many minerals, including iron. Jaggery also has a wonderful deep taste of its own, much unlike the stark sweetness of refined sugar. We will use plenty of jaggery when we make the gharge today. "G" also stands for two ever-popular vegetables in Marathi food: gajar or carrot and guvar or cluster beans, a type of bean with a subtle bitter aftertaste, wonderful for making stir-fries. 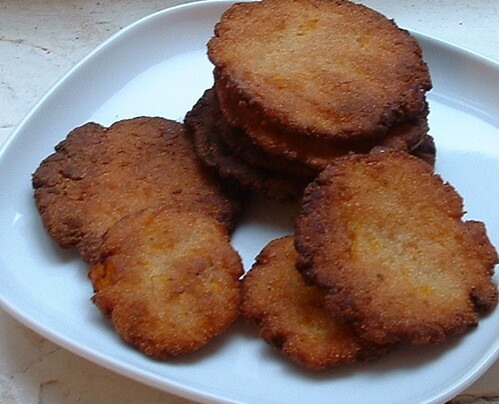 The gharge or sweet pumpkin puris are so appropriate to make in October! The markets are overflowing with pumpkins of all sizes. In India, I have never seen whole pumpkins being sold. Vendors cut them into reasonably-size wedges. Pumpkin is very popular and is used in a variety of dishes, mostly savoury. But the gharge I am making today are a sweet tea-time snack. This was my first time buying and cooking pumpkin (yes, I know, I have so much to learn!). I was at Union Square yesterday, a neighborhood of Manhattan beloved for its great Farmers Market. I picked up a pretty small pumpkin for this dish. My ambitious plan was to use the flesh for this dish and to try and carve a little jack o' lantern with the shell, and to make toasted pumpkin seeds. The first surprise came when I tried to cut the pumpkin open. This stuff is hard to cut, but I managed to lop the top off the pumpkin. Next time: scooping out the seeds, along with all the fibers. This was easy and I saved the seeds to roast. Then I wanted to scoop the flesh out but that turned out to be quite impossible. I finally had to hack the pumpkin into pieces (bye bye jack o' lantern) and use a knife to remove the skin from each section before chopping up the flesh. 1. Combine grated pumpkin and jaggery in a saucepan and cook together on medium heat till pumpkin is cooked and the mixture is a thick sticky mass. 2. To the warm mixture, add the warmed oil, cardamom powder, salt and all three flours. Knead well. 3. Make small golf-ball sized balls of this mixture. Pat each ball into a circle (puri-shaped). This can be done easily on a greased plastic sheet. Mine turned out pretty rustic-looking :) which is to say, all kinds of odd sizes. But it can be done more neatly. 4. Deep fry the gharges till golden-brown in about 1 inch of oil. 5. Drain on paper towels. When gharges are cool, store them in an airtight container. The verdict: these are easy to make and quite delicious! The outside of the gharge is crisp and the inside is quite chewy. I enjoyed the deep taste of the pumpkin and jaggery. It is a healthy and filling snack. I also enjoyed my first experience cooking pumpkin from scratch. 1. When frying these, I noticed that sometimes there would be a "pop" in the oil, I think this is due to the fact that the dough has tiny pockets of water from the pumpkin mixture. Do be a little careful while frying. 2. I tried making some, and while they looked fine, they became really hard and a torture to eat. So I would recommend the deep frying. If done properly, very little oil gets absorbed. Next week we look at "H". This is quite a difficult letter and I would really appreciate some ideas! I'm always interested in learning new things about Indian cuisine, so I'm glad that IMBB #20 brought me to your blog. It's on my feed list now, so I won't miss H-Z. As for gul / jaggery, how can I tell if it is made from sugar cane or palm? Will the package be marked? As for carving jack o' lanterns, most of those pumpkins are 'sacrificial' and will simply rot on the porch (unless some naughty teenagers get to it first!). Even the parts cut out will generally not be eaten (but we would often roast the seeds). Carving the pumpkin is not easy, and it takes significant skill (and the right tools) to make something artistic. In my childhood (in mid-Michigan), I carved a pumpkin every year, and it was difficult to move the knife through the pumpkin to get a perfect set of scary fangs or demented eyes. The knife always had a mind of its own. Hi Nupur, these look fantastic! To answer your question about pumpkins, I've read that the large ones sold for carving are not grown for eating - their flesh tends to be stringy and not very flavorful. Pumpkins grown for eating (often labeled 'sugar pumpkins') are much smaller, but much more delicious. It is kind of a waste to carve the big ones and let them rot, but that's Halloween tradition! Hi Clare, thanks :) though I have to learn to be a little neater when making these! Hi Marc, as far as I know, Indian jaggery is made only from sugar cane. If you have access to an Indian grocery store, that would be the easiest way to get gul. In this recipe, I am pretty sure that other sugar such as dark brown sugar/turbinado and unrefined sugars like these would work well. And I have to tell you, I have a new-found respect for pumpkin carvers! Thanks for the informative comment! Hi Melissa, thanks for answering my question! I now know that I did the right thing by buying the smaller pumpkin for this recipe. I'm so glad the chavli curry worked out! :) thanks for letting me know. Cream of wheat is, rava made of wheat? Is Whole Wheat flour different from the wheat flour we get here Inidan groceries, I'm new to cooking, I'll be glad if you clear my doubts. Hi Rohini, From what I know, rava/sooji is the Indian name for coarsely ground wheat, which is called farina or semolina in english, and cream of wheat is the most commonly found brand of this product in american stores. so, to cut a long story short, rava is the same as cream of wheat for all practical purposes. I found that the whole wheat flour in american stores is not as finely ground as "atta" and cannot be used in place of atta. so I buy wheat flour from indian stores. however, "maida" is the same as the all-purpose flour sold in american stores. Thanks for your question, and happy cooking! Hi Nupur, me and my husband had a sudden brainwave to make ghaarge as a present to take with us when we visit my sister and her husband for New Year's. Not really expecting to find a recipe I googled it nevertheless and came across your charming blog. Very well written and a very good recipe too. Best wishes and keep up the good work ! Hi Sup and Sun, thanks for your encouraging words :) I hope the recipe works out for you! Happy New Year! me suddhaa google varunach aalo....ghaarge vagyere baaher miLat naslyaane me 'swatahach karuyaa' mhaNun recipe shodhat hoto.... thanks.